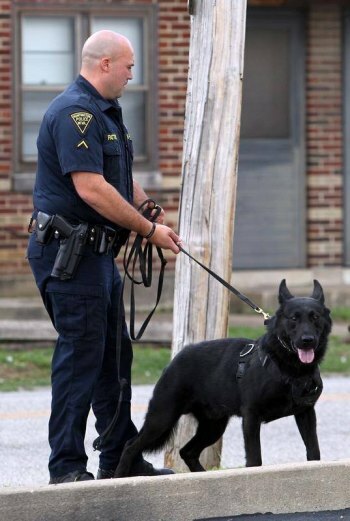 A local business is working with a national nonprofit organization to raise $10,000 toward the purchase of four protective vests for the Huntington Police Department’s K-9 Unit. Tri-State Pool Distributors, a local wholesaler that provides pool supplies to retail stores in Ohio, Kentucky and West Virginia, is teaming up with Spikes K9 Fund to raise money and purchase the vests, which are made with a lightweight, ballistic and stab-resistant material that helps protect a police K-9 when it is serving in the line of duty. The fundraiser will be from 6 to 8 p.m. Friday, June 8, at Fat Patty’s, 1935 3rd Ave. The event will include a silent auction, appetizers and cash bar. All proceeds, which are tax-deductible, will go toward purchasing the vests. The event will also include an appearance by James Hatch, a retired special warfare operator who was a K-9 handler on several military deployments. On his final deployment and the night he was critically wounded, Hatch’s life was spared by a K-9 named “Spike.” From that point forward, Hatch has oriented his life around the training, care and preservation of working dogs. In addition to working as the founder and president of the fund, he works with, local law enforcement and has adopted a former service dog in need of medical attention. For more information about Spikes K9 Fund, visit www.spikesk9fund.org. Those who cannot attend the fundraiser on June 8 but would still like to donate can mail donations (Check payable to "Spike's K9 Fund") to Philip Macri, Tri-State Pool Distributors, at PO Box 6473, Huntington, WV 25772.